YOU, the freight broker, employing your match-making skills. Proper business education and the drive and determination to succeed. Ability to enter into contracts. Can employ independent contractor to make calls, maybe 10 hours, or so, per week. But you DO need money to carry your personal living expenses til you get established. 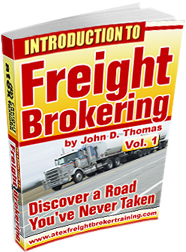 Learn the financial, business and legal issues that impact freight brokers. How many loads can one person handle? Difficult to say but add help as needed. Lastly: the training manual only works on MS PCs – not Macs. This has been a snap shot and shows you how to get started quickly. For more detail, please read the entire website.